rule after the Treaty of Paris in 1763, a top priority of the crown was to have their new acquisitions surveyed. In 1764, Captain Samuel Holland was appointed Surveyor-General and given the task of surveying British holdings in the New World. He recommended what is the current site of Charlottetown be the capital of the colony and suggested that it be named Charlotte Town in honour of Queen Charlotte, wife of George III of England. In 1768 Captain Holland asked army officer and surveyor, Charles Morris of Nova Scotia to lay out the streets of Charlotte Town. 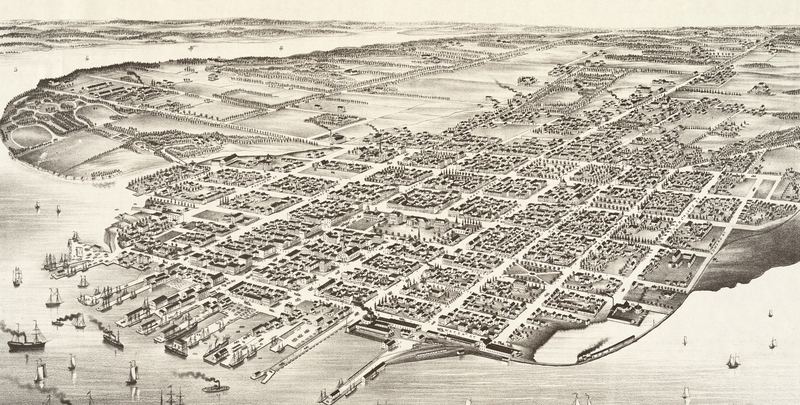 Three years later, Governor Walter Patterson ordered surveyor, Thomas Wright to expand upon the Morris plan, and create a layout of the town with 500 lots (84’ x 120’ each), streets 100’ wide stretching north from the Harbour and streets 80’ wide crossing at right angles, a central square for public buildings and four large green spaces or “squares”. Later alterations allowed an encroachment of 40 feet on the east-west streets, creating lots 84’ x 160’, the elimination of some streets, and a few lot consolidations. On the non-water sides of the 500 Lots (the main town site), a 565-acre buffer of land called a common was established for future town expansion. Adjacent to the common was the Royalty which was a large expanse of 12, one acre fields set aside for pastureland. Many changes have occurred over the years, but the basic plan of the 500 Lots, Common and Royalty are still evident. Formal government in Charlottetown began with the arrival of Governor Walter Patterson in 1770. In addition to being the administrative center of the Island, Charlottetown was also the headquarters for the military, the militia being housed at Fort George. Charlottetown became a City by act of the General Assembly of Prince Edward Island under the City of Charlottetown Act in April 1855. One hundred and thirty-nine years later in 1994, the Charlottetown Area Municipalities Act was proclaimed (effective for April 1, 1995) to create the new City of Charlottetown by amalgamating the communities of Hillsborough Park, East Royalty, West Royalty, Winsloe, Sherwood, Parkdale, and the City of Charlottetown. Charlottetown has the distinction of being the Birthplace of Confederation. It was here in September 1864, where delegates from Nova Scotia, New Brunswick, Prince Edward Island and the Canadas met to discuss what was originally meant to be Maritime Union but soon became a union of British North America. The wearing of mayoral regalia is an English tradition dating back to at least the 14th century. By the reign of Edward III, livery companies (previously called guilds) which were heads of civic districts, assumed a distinctive uniform type of dress. Livery companies and in turn the municipal corporation arose out of the merchant and craft industries of the towns, as these possessed both wealth and property in addition to having organizational and administrative ability and potential. It is this connection and the dominance of livery members in local affairs and administration to which the familiar robes owe their origin. The Chain of Office was generally custom-made. The Charlottetown Mayoral Chain of Office badge was designed and presented to the City of Charlottetown in 1919 by Mayor G. D. Wright who served in this office from 1918-1920. The Mayor customarily wears this chain for ceremonial occasions, such as receiving visiting dignitaries (Royalty, Governor General, foreign ambassadors, etc). Charlottetown: A History, Peter E. Rider, Canadian Museum of Civilization, 2009. Charlottetown The Life in Its Buildings, Irene L. Rogers, The Prince Edward Island Museum and Heritage Foundation, Charlottetown, 1983.